Jumeirah Beach Hotel, Dubai is a wholly unique experience. 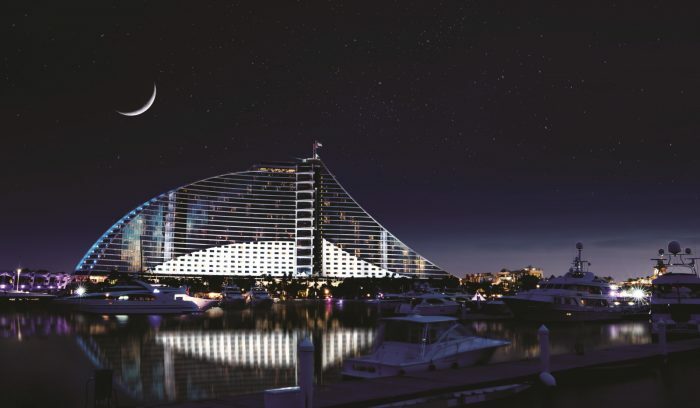 Shaped like a wave, this architectural beauty is iconic to the Dubai skyline. Well located on Sheik Zyed Road, this hotel is a show stopper, with the Madinat just a stone’s throw away. Feasting at Jumeirah Beach is a tantalising experience, catering for international cuisine and stunning bar with panoramic views of the city. True to Dubai, your stay wouldn’t be complete without indulging in the breakfast spread which sets you up for your day on the beach. This well planned resort has a private beach as far as the eye can see and a choice of pools to laze by. The kids club allows for a perfect intervention for some well deserved me time, with kids thoroughly entertained in the days activities. Endless choices to stay entertained, the Wild Wadi theme park is a wonderful way to spend the day meandering around the lazy river. With a water theme park to enthrall guests of all ages, your day is filled with laughter, waves and great rides. Once finished with Wild Wadi, enjoy the vast facilities at the spacious gymnasium and Talise Spa, to unwind. Each of the rooms at the Jumeirah Beach Hotel faces the beach and Arabian Gulf; offering pretty sun sets for the entire family and blending pastels of the water and golden sands with the elegant interiors of the suites. A revitalising experience, the Talise Spa is your time to treat yourself. Relax and choose from amenities including saunas, hot tubs, Jacuzzi, steam room and a plunge pool Talise. Indulge in a Talise Signature Therapeutic massage or a Elemis Aroma Spa Ocean Wrap. For a more secluded stay at the Jumeirah Beach Hotel, Dubai the exclusive Beit Al Bahar villas (only 19) are a gem for a honeymoon destinations. Jumeirah Beach Hotel’s best kept secret is focussed on intimacy for its guests, seducing them with the Arabian setting of the villa. Sensationally designed, the villas create a stunning setting for you to unwind. Enjoy the facilities at Talise Spa and gym to help pass your days and with a private tent to lounge by the executive pool just for you and your loved one, your honeymoon is enriched by the lavishness and sophistication of the Arabian culture. The international cuisine offerings are incredible and guests are left wanting for nothing at the Jumeirah Beach Hotel. If this hotel wasn’t stunning enough, the choice of restaurants leaves no stone unturned to bring your culinary adventures from all over the world. Beachcombers cater for those days you want to laze by the pool. Not needing to move, the burgers and sandwiches make their way to you and indulge in the fresh fruit smoothies. La Veranda – this breach fronted restaurant is casual dining for those effortless eating choices. Pastas, salads and pizzas made fresh as you take in the fiery reds of the sun set. Carnevale – elegantly designed, this 1st floor restaurant has great views and excels in cooking original Italian dishes that leave you wanting for more. The sauces are rich in taste and texture and the bread so soft to touch that you will spend hours at this Italian bistro. With a great selection of wines, there is no better way to spend your time. Dhow and Anchor – Not going unnoticed this English inspired pub is quaint and cosy. Serving posh pub food, this hang out is a little piece of England whilst in the Arabian way of life. The list goes on including German and Arabic restaurants too. Each night can boast a different cuisine from a different continent.